This richly textured look at Saturn's moon Tethys shows the huge crater Odysseus and its central mountain in relief, as well as many smaller impact sites. Vertical relief on solid solar system bodies is often most easily visible near the terminator (the line between day and night). Tethys is 1,071 kilometers (665 miles) across. 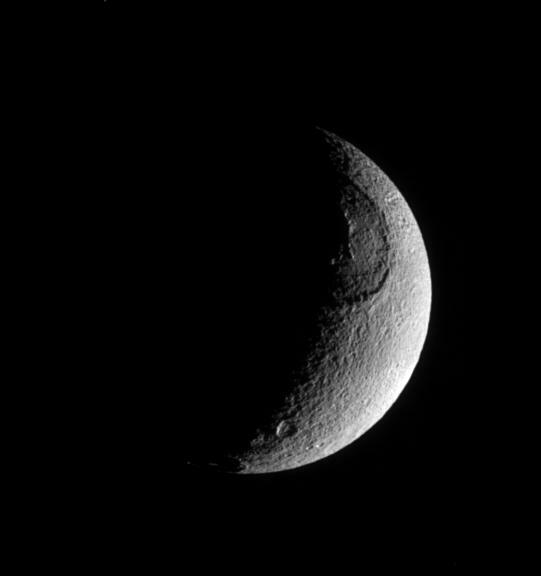 The image was taken in visible light with the Cassini spacecraft narrow-angle camera on June 27, 2005, at a distance of approximately 490,000 kilometers (304,000 miles) from Tethys and at a Sun-Tethys-spacecraft, or phase, angle of 117 degrees. The image scale is 3 kilometers (2 miles) per pixel.